We have visited UCLA in the winter on a sunny December day. Even though the day was short, we had a great time. I always like visiting the UCLA campus, regardless if it’s summer or winter, school day or weekend…I just love it. Maybe it’s because I graduated from UCLA myself…yeah it’s because of that. 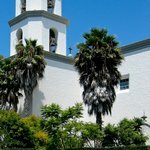 However, I believe anyone can enjoy visiting the campus for a day, including your children. 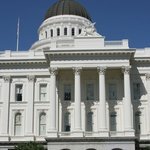 Well, UCLA is well known in Southern California and any of the online maps would be able to give you accurate driving directions. Personally, I like to exit the 405 freeway at Sunset Boulevard and go over the 405 freeway. The UCLA campus is right next to the 405 freeway. Parking is always a problem at UCLA, but for visitors, especiall on a weekend day you can look for parking in Lot 6. You can purchase parking permits from the information booths. Walk up Jass Steps all the way to Dickson Terrace. 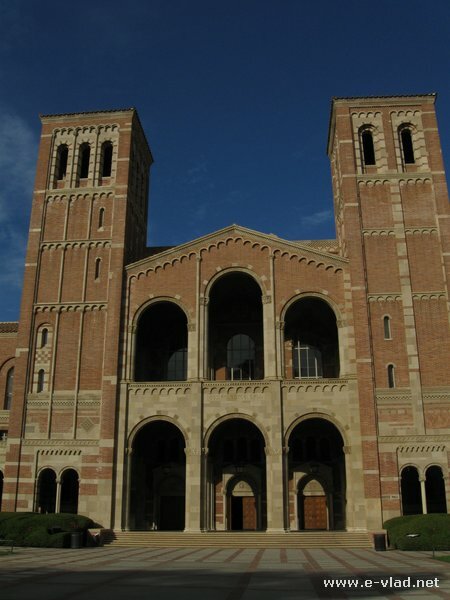 Take pictures with the orginal UCLA building (Royce Hall, Powell Library, Haines Hall and the Humanities Building). Visit Powell Library. This is a public university and you have access to see the interior. Take a stroll through the Murphy sculpture garden on the North end of the campus. The Inverted Fountain is an interesting concept but not very exciting. Go down (or up) on Bruin Walk on a regular school day. You’ll quickly get a sense of how busy UCLA campus is. Visit the Ackerman Student Union store. Besides lots of UCLA gear you can buy, the bookstore is well stocked with hard to find technical books. Attend one of the UCLA classes…really, they’re great and you can do it! Just talk to the professor before the class and usually it’s not a problem. Powell library is one of the four original UCLA buildings. The Powell Library building has been renovated recently and it boasts great Romanesque Revival architecture on the outside as well as on the inside. The Powell Library building is one of the hallmark buildings on the UCLA campus. Powell Library is the main undergraduate library on the UCLA campus. Even though it provides lots of study space, it is often overcrowded because it’s the favorite study area for most UCLA students. The “old feeling” of the interior architecture is very relaxing and provides a unique athmosphere for students. During my UCLA days I loved studying in Powell as well and it was my favorite place to study as well. 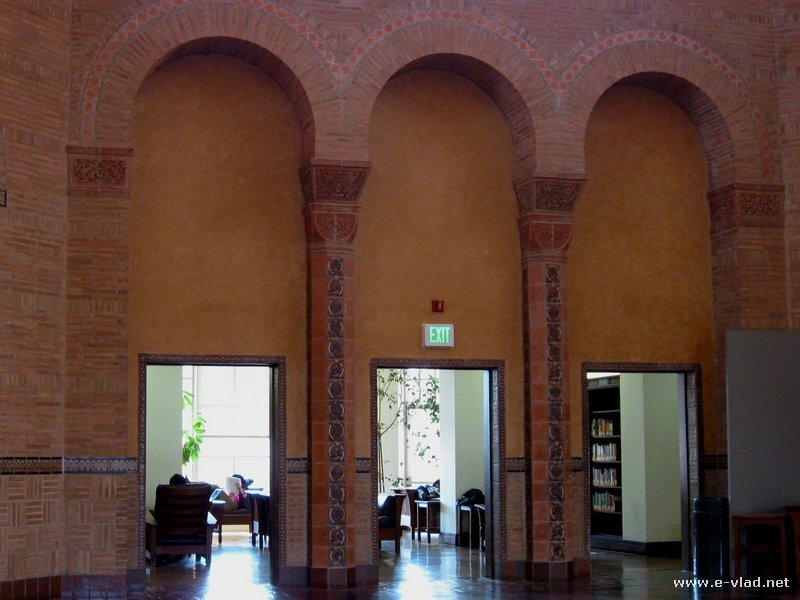 The Powell Library interior shows arches and other Romanesque architecture features. Dickson Terrace is a great place to take pictures from. You have a great view of Janss Steps as well as the four original UCLA buildings. This is a great place for taking pictures. 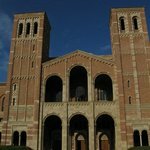 You have to take a picture with Royce Hall since this is the building that appears on all UCLA postcards. This will definitely prove you have visited UCLA. Royce Hall is one of the four original buildings on the UCLA campus. Here is the UCLA Campus Map.